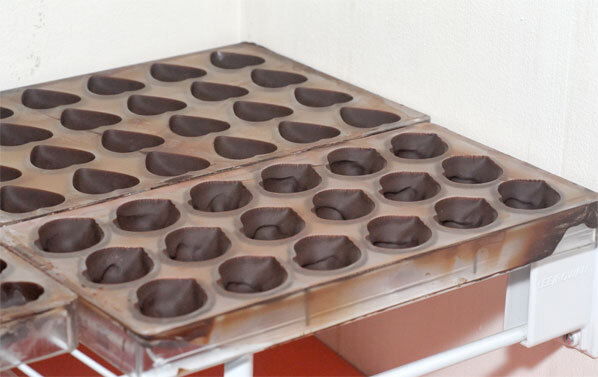 Okay, so this week I am winging it – plunging in and attempting my first signature piece, as a student chocolatier. I have been studying the gorgeous, inspired work of Ecole Chocolat graduates, and am trying very hard not to feel daunted, but rather inspired, by their vision, good taste, and precision. To give myself the confidence I need to plunge into the kitchen and start creating something new, I try to relate this nerve wracking experience to a world with which I am already familiar. I think about walking into an audition. Well, that’s just it – you don’t just walk in – you prepare. Vigorously, thoroughly, so that you know, from the moment you walk into the room, you are ready for anything the director may throw at you. You know the person you are supposed to be portraying, you know how you feel about all the other characters, and you know what you want to achieve. And you know these so well, that you can adapt and improvise. And you have your own, unique ideas. That personality you bring into the room with you, that special something, just a little different than every other person auditioning for the role – who will of course, have their special something. Hmmm. My special “chocolate” something. What could that be? I explain to him that I feel talentless, uninspired and frustrated – and that I have to get this chocolate homework done! He gives me a big hug and reminds me that I wanted to make something “Nana would have liked, and it has to be something you like, too”. He is right, of course, my wise, kind hearted, insightful kid. I make a list of flavours I adore. Passion fruit, mango, strawberry, cool mint, Earl Grey tea. I think about where I live, and the kind of foods we grow here, although not in January, which is when this piece is being written, and my mind is cast back to the warmth of the summer, and the smell of berries. I have bags of frozen-at-their-peak, organic local strawberries in my freezer. Mum loved strawberries, too. Perfect. I have my first ingredient. 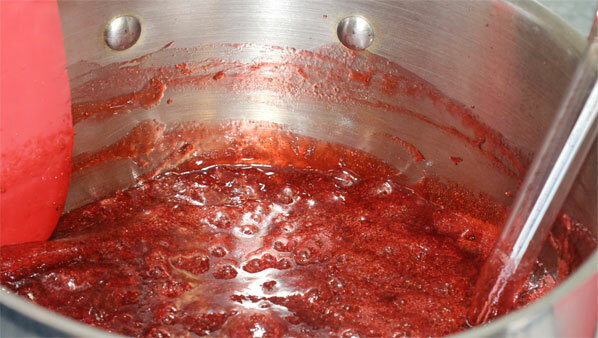 I make a super-concentrated, ever so lightly sweetened fruit puree from half of the berries. 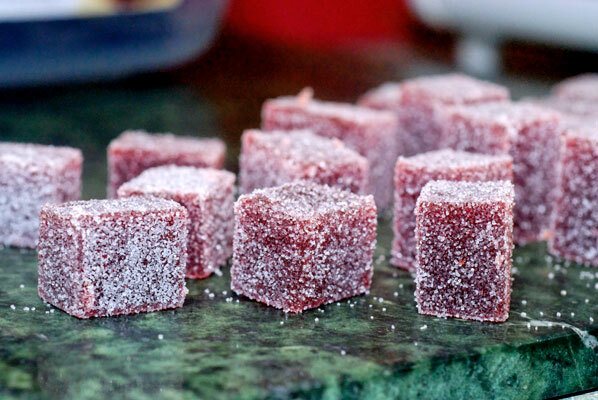 With the other half of the bag, I whip up a batch of strawberry Pate de Fruits, as I have become rather addicted to them. I will coat some these with chocolate, after I have completed my signature piece attempt. Now, I need something to soak up the liquid goodness of the puree. 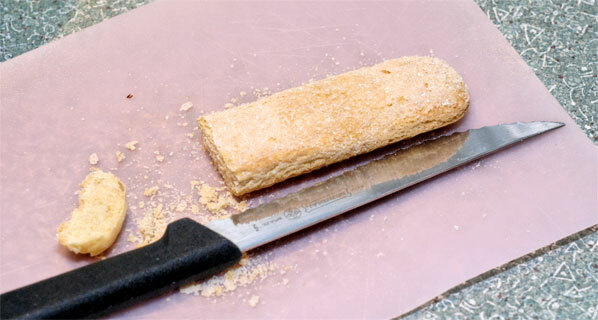 I made a tiramisu yesterday, and have ladyfingers left over, so I crumble them, mix with a bit of puree, and taste. Sweet, tart and fresh tasting. And it reminds me a little bit, of the “wee chocolate cups” dessert Mum used to make, sans whipping cream. 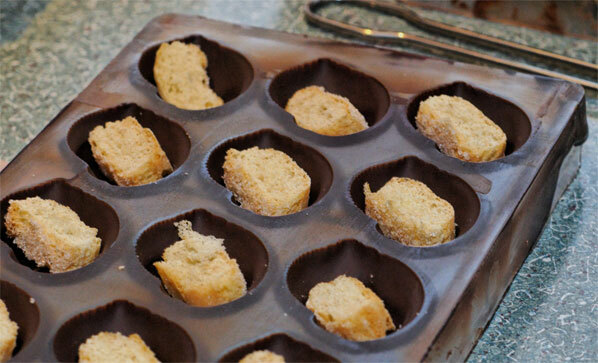 Now, will this work as a filling in a molded chocolate? I get out the poly carbonate molds and temper some bittersweet chocolate. My partner remarks that my skill at chocolate chopping has really improved. Would that the same could be said for my tempering skills. 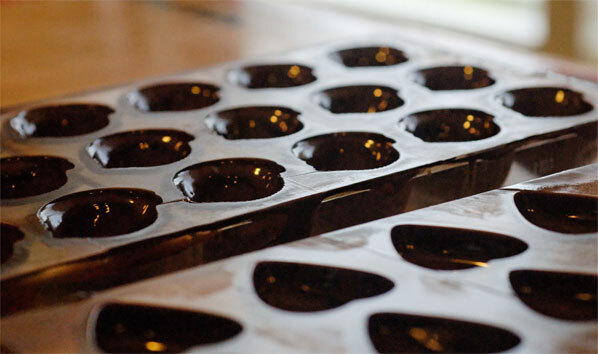 I am reminded that I still need practice in this technique, as I try to keep the chocolate at a constant temperature and viscosity, as I pour it into the molds and scrape down the top and sides. Fortunately – although I don’t think he is thrilled about it – my son’s room is rather cold, due to lack of proper insulation, and provides the ideal place to set the chocolate. 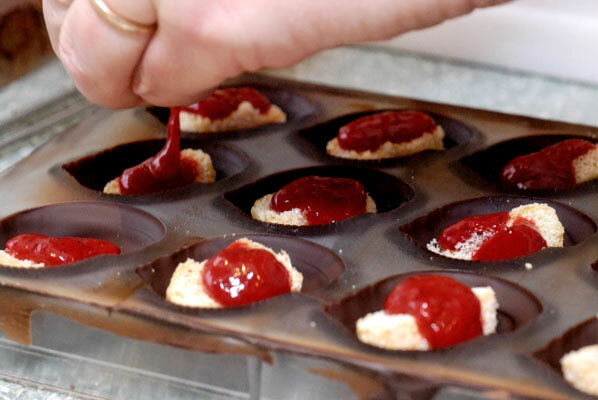 When I hear the distinctive cracking sound, which means the chocolate has contracted from the sides of the molds, I place a piece of lady finger into each cavity, and pipe a blob of strawberry puree on top and around the sides of each. I notice that some of the cavities are a little over-full, but I assume this is due to the dryness of the ladyfinger pieces, and that they will settle down, once they have soaked up the puree, so I leave them for a bit, and get out for a badly needed walk. I use a small spoon to sort of squash the rebellious pieces of lady finger down into the molds, and temper more chocolate to do the bottom coat. As I do this, I think about the audition I had yesterday, not from any artistic point of view: just that I ended up finding parking right in front of the Vancouver Used Restaurant Kitchen Supply Store – a funny little hole-in-the-wall place, that I am sure, if I’d had time to look through it, would have had a used tempering machine! Wishful thinking, perhaps, but I must go back, soon … just in case. Oh dear. The cavities are over-full, and it is with great difficulty that I am able to get the backing coat of chocolate on, and the excess scraped off. I swear a few times, as bits of lady finger are dragged across the surface of the mold, and have to be stuffed back into the cavities. I have contaminated the chocolate I have poured on this mold, and I must employ another bowl to hold the “bad” stuff, while attempting keep the “good” stuff, from the original bowl free from bits of foreign stuff (puree and ladyfinger bits). Finally, all four molds are filled, backed and set aside on the marble slab. Now, all I can do is wait and hope they will release, after all of my ham-fisted exertions. I clean up the very messy kitchen, and figure I deserve “two minutes peace” (a Mum quote). I sit down with a cup of tea, feeling underwhelmed with my efforts. I absent-mindedly stir my tea, and notice a black blob circling round and round in its depths. Perfect. This day just gets better and better. After I have fished out the fly, and tossed the whole pot of tea down the drain, I know I must get out of this kitchen! I feel much calmer. I left the kitchen, escaped into the depths of a script, sure in my heart that I would never get the hang of this chocolate thing, and have emerged, a few hours and a dinner later, ready to face my fears. I have put way too much importance on getting this signature piece right the first time. Classic mistake in theatre. It’s what rehearsals are for. There is no difference with this. I must view this first attempt at a signature piece as my first draft of a new play. And this one will be a cliff-hanger. Tune in next week to discover how the dark chocolate/strawberry/biscuit bonbons actually taste!